Yao has been in Houston the past week, and he’s sticking around through All-Star weekend festivities. Yesterday he had lunch with the massive defensive lineman for the Houston Texans, J.J. Watt, who also was the NFL Defensive Player of the Year this past season. 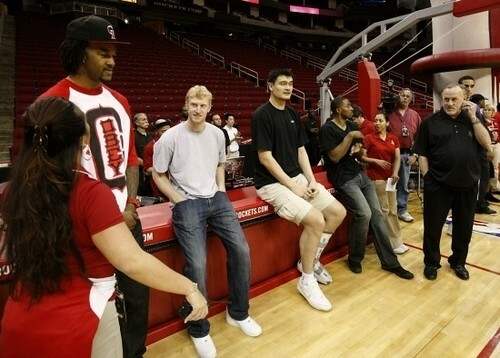 Yao made his second appearance at Toyota Center this week, showing up courtside to cheer his former team to victory. We’ve got more photos here in the forum. New sponsor: unique travel gift for the holidays on sale! As many long time readers of this site have known, I have limited myself over the years to not accept commercial opportunities. Sure, I have ads that run on the site, but they really aren’t that intrusive. But there is one company that I have recently accepted as a sponsor that I thought was worth creating a special blog post for. It’s because they have a product I think can help many shoppers (like myself) who want to buy a unique gift for the special women or men in their life. It’s called the PamBee, which is a combination of a travel blanket, pillow, pillowcase and eyemask that all folds up into the size of a laptop. So it doesn’t take valuable carry-on space the airlines limit you from using on the plane. The PamBee was designed by a flight attendant who went above and beyond to use materials that are much better than the travel blankets the airlines provide…er, when they did provide them back in the day. The fabrics are silky soft and smooth, and are even machine washable. And the PamBee comes in 5 different styles to fit any taste, even a man’s. They also offer monogramming and gift wrapping. And for a limited time, they are offering a special discount through the holidays, and have free shipping that can you get a PamBee in 2-3 business days anywhere in the U.S.! Thanks for supporting this special sponsor of ours! Click here for more about the artist and the project. Hot off the press here. Have you ever been frustrated with bad ref calls in NBA games? Now there’s a place for you to read analysis on bad ref calls (and good calls) from every NBA game, and vent if you feel your team got robbed by the refs! Checkout RefCalls.com! 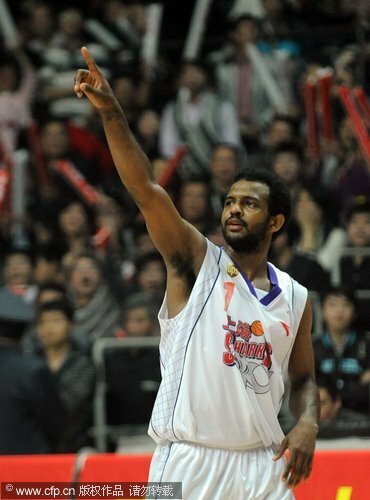 Also check out their sister site TopFlops.com where they feature the worst and funniest flops by NBA players from each game. The video on their site is quite hilarious! 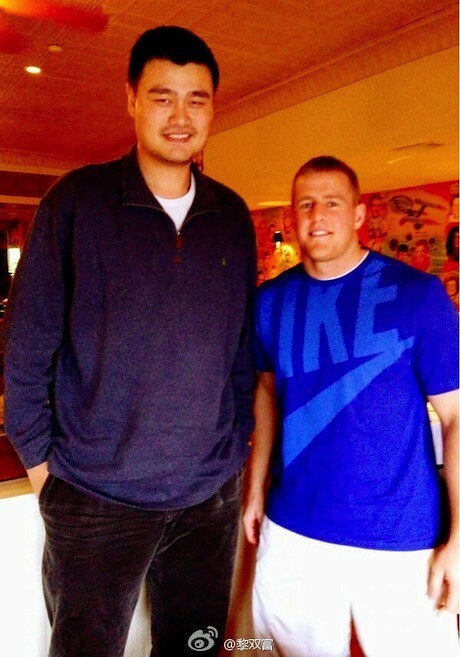 Now that Yao is off crutches, he has been able to get out more often. On Wednesday night, he appeared at the Rockets’ game against the Warriors to cheer his teammates on. 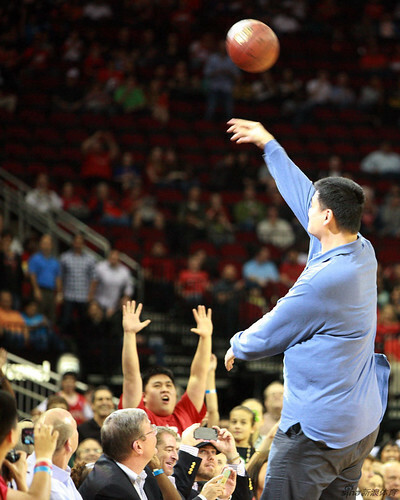 Click here for more photos of Yao at the Rockets-Warriors game. 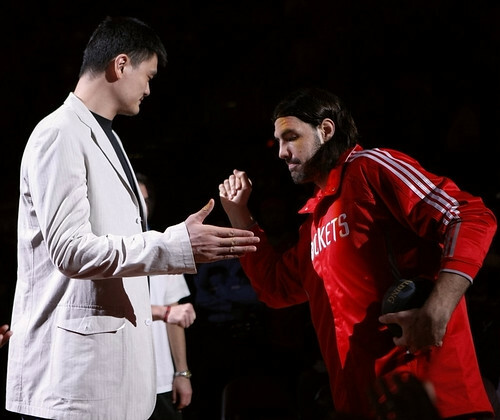 Then on Thursday, Yao appeared at Toyota Center along with other Rocket teammates to thank season ticket holders for their patronage. 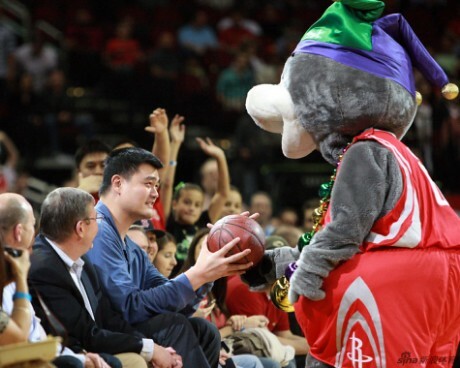 Click here for more photos of Yao at the season ticket holder event. 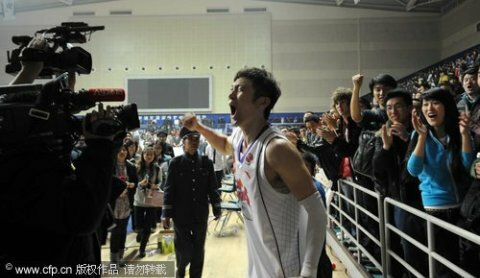 Yao also told reporters that he will be traveling with the team on their next road trip when they play Miami, Philadelphia and New Jersey. This road trip is obviously huge since it will have a big bearing on if the Rockets make the playoffs or not, so it’s good to see that Yao will be supporting his teammates even though he isn’t required to go. Yahoo Sports’ “Ball Don’t Lie” blog threw alot of love today at Chuck Hayes by writing an entire post about his triple-double last night. It’s an interesting read. They analyze various players’ stats to determine if it was the most improbable triple-double in NBA history. Check it out here. All of this brings to mind what Yao had said last summer when after working out with Hayes, was very impressed with Chuck’s improved offensive skills. 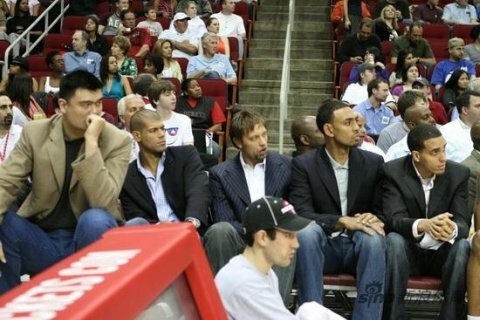 Looks like Yao knew first that Chuck was on his way to do some special things this season.